Owner and Resident Jewelry Artist, Angela Lensch, will debut her 2015 India Collection of hand woven Sterling and Gold Jewelry, on Thursday, July 23rd from 4-8pm. Join us & sample authentic Indian cuisine which will be served from Kinara Urban Eatery, Sturgeon Bay. The 2015 IndiaCollection weaves the beautiful ‘Sari Wrapped’ wooden spheres’ which arrive from India as part of the Fair Trade Beads that Ms. Lensch helped develop in Jaipur, India. Incorporating them into her exquisite gold and silver woven jewelry makes each piece a unique collaboration of the two countries. 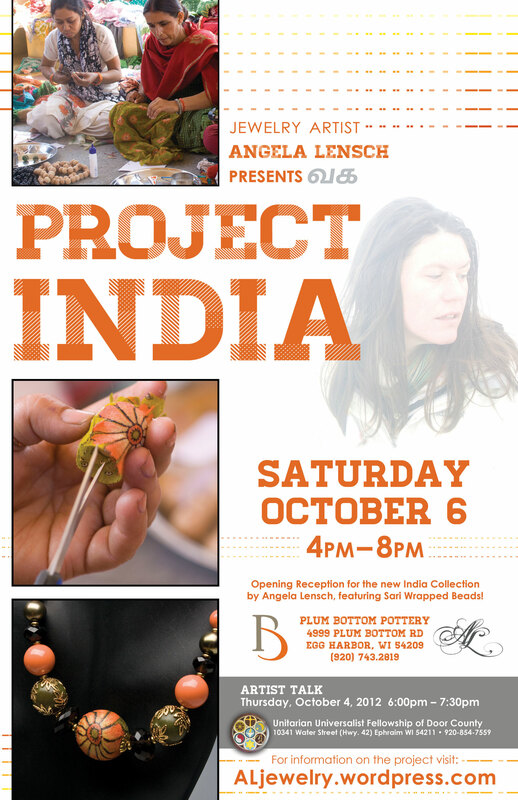 In 2012, Lensch received a grant from the Wisconsin Arts Board and the Peninsula Art Association to help support her project in India. In India, she worked with a women’s empowerment group, teaching them the art of using sari fabric to make unique fair trade beads. This is the 3rd Collection that Lensch has created that feature the Sari Wrapped Beads since their inception in 2012. The first collection to be debuted in the Angela Lensch Gallery, located at the south end of Egg Harbor, 7653 Hwy 42. Savor a taste of India, learn more about Angela’s journey, and view the stunning India Collection. Read more about Angela’s project by clicking on the “Project India” tab to the right.